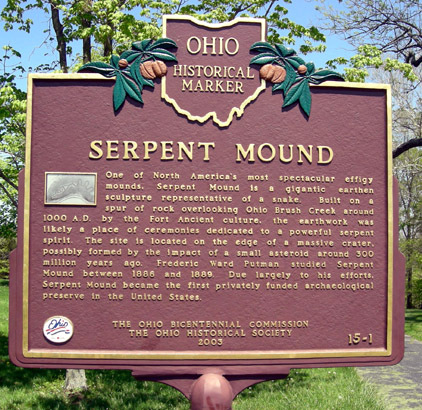 Stage 1 - Adena: The name "Adena" comes from the location that several of these mounds were located, the property was owned by Thomas Worthington, an Ohio political leader, who named his estate "Adena." The Adena culture began around 800 BC and are identifiable by the way they built small burial mounds. They were conical in shape and the Miamisburg Mound in the photo below is the second largest of these known, being 68 feet high (about three floors). These people who made mounds like this seem to have had a burial ceremony where they prepared the body's spirit for the afterlife. First they covered the body with red paint. Red supposedly represented the color of blood and life. It is thought that they believed the red paint allowed the person's spirit to live after death. 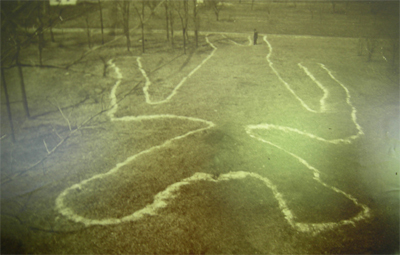 The painted body was laid on a bed of bark strips on the floor of a burial house. To help the dead enjoy life after death, they placed jewelry, clay pipes, beads, and other useful objects around the body. Finally, they set the burial house on fire and cremated the body. After the house burned down, the Adena covered the ashes with earth. Over time, many times, more people were buried on the same mound. The burial mound grew higher over the years. The Miamisberg Mound shown below has several layers of "houses" and cremations within it. Miamisburg Mound as it looks today (the steps were added by the state) This site can still be visited today! 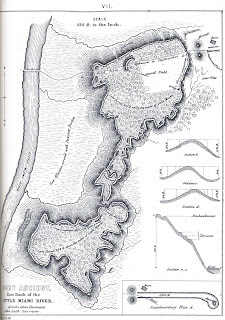 Stage 2 - Hopewell: Squier and Davis performed the first intensive survey of the earthworks and mounds at Hopewell Mound Group in 1845 (Squier and Davis 1848). 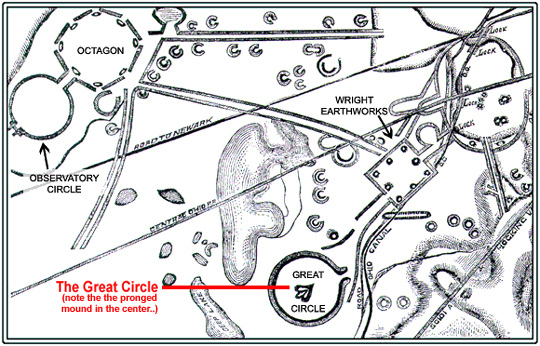 At the time of their survey, the earthworks were owned by W. C. Clark and thus were dubbed the "Clark?s Works." The site did not become known as Hopewell Mound Group until the publication of Moorehead?s 1891-1892 excavations in 1922. About 300 B.C., the Hopewell civilization began, and they may have lasted up until European contact. 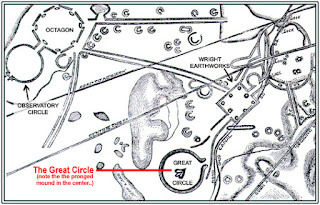 They were incredible artist and engineers - sculpting our landscapes with geometric shapes like the Great circle in Newark, Ohio that is a perfect circle of embankments and an interior ditch that encloses 4 acres. This site can still be visited today! 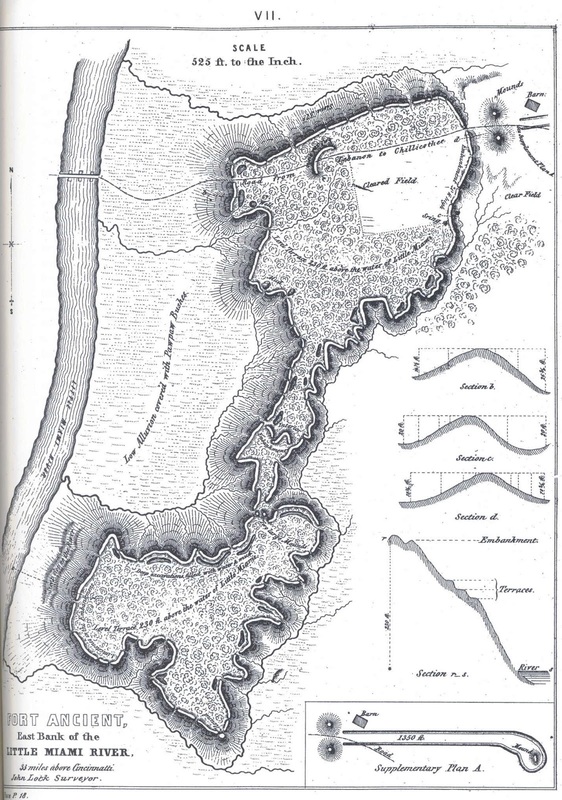 They also made embankments and interior ditch around the summit of a site called Fort Ancient - that i personally think is ALOT like Spanish Hill. The Hopewell were the strongest civilization for 500 years and grew in the middle of the United States. They were skilled at arts and crafts. They wove mats, made ceramic pots, and carved figures from bone, wood, and metal. They made spear points and knives from obsidian. Hopewell clothing was made from animal skins. They wore jewelry made from copper and shells. The Hopewell culture spread through trade. Their trade reached from the Atlantic Ocean to the Great Plains, and from Lake Superior to the Gulf of Mexico. The image below is an actual picture of one of the "caches" found in the region of the Hopewell Mounds. 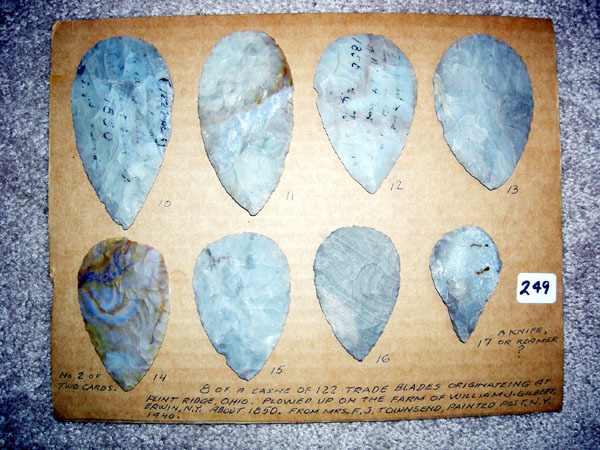 There are 7,232 flint discs here in this image and we know that they were "unfinished points" that a trader would take from this place and follow the paths eastward into our area to trade with the people that lived here. Sometimes these traders would bury parts of their "inventory" in holes in the ground as a means of storage along the way or for safe keeping. Once the person got these unfinished points form the trader, they would continue the process to make them into the type of point they needed. 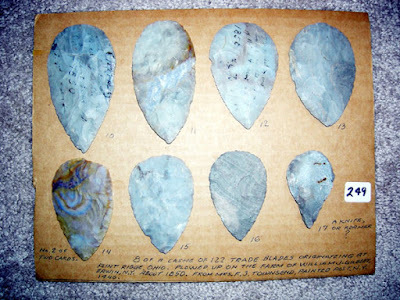 We know that they did this because some of these "caches" of "trade blades" have been found in our region. Stage 3 - Mississippian: The third and greatest mound building civilization was referred to as the "The Mississippian Culture." These people lived in the Mississippi River Valley from 800 to around 1400 A.D. 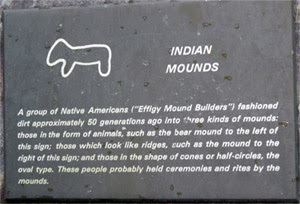 They built huge mounds, some as big as football fields. they also had large cities (complexes) enclosed inside palisades with smaller mounds as well as one big large one where the chief would preside over his city. Their largest city was Cahokia. Cahokia was located near East St. Louis, Illinois. LOTS MORE TO COME - CHECK BACK SOON! (C)Copyright SpanishHill.com and Deb Twigg. All Rights Reserved. Spanish Hill is Private Property - No Trespassing Allowed. (C) Copyright 2015. All Rights Reserved. Spanish Hill is private property, no trespassing. Picture Window theme. Theme images by wingmar. Powered by Blogger.